One of the variant covers, by Amos Maldonado, for Black Panther #1 displays a miniature toy-like Panther figure apparently battling a similar mini-Captain America. 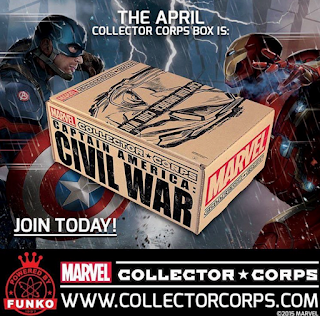 This cover was part of the April 2016 Marvel Collectors Corp box designed by Funko -- "a purveyor of pop culture and licensed-focused company." The company designs products in partnership with Marvel for the Marvel Collectors Corps, a subscription box service for "the avid Marvel fan, each box delivers 100% exclusive premium collectibles, apparel, and accessories." The themes for the boxes often coincide with major events taking place in the Marvel universe or extended universe. The theme of this most recent box was "Captain America: Civil War" to coincide with the film of the same name. T'Challa/Black Panther, played by Chadwick Boseman, appears in the movie. The enclosed variant corresponded to the April 6 release of Black Panther #1. The child-like Panther and Captain America are reminiscent of the Skottie Young Marvel baby covers as well as his kitten variant for Black Panther #1. These Funko pop figures circulate widely in the worlds of some collectors and fans. The Black Panther variant cover along with pop figure and card. Source.